The opening will take place on Saturday March 13, from 5:00 pm till 7:00 pm and the show will close on April 24. We would be very pleased if you could join us. During the opening, we will also present the publication, #3 Zakłady na Życie (Plant-Life), with a text by Will Holder On the labelling of exhibits and a signed and numbered edition of 500 by the artist. This publication can be ordered for 10 euro at Wilfried Lentz Rotterdam, Lüttgenmeijer Berlin, Motto Berlin, Castillos/Corrales Paris, Pro qm Berlin, Boekie Woekie Amsterdam. In keeping with his earlier enigmatic productions, Beckett will show all new works, this time translations and re-workings of material relating to the developments and occasional demise of Polish industry. The show is a component of a larger environment, – a stage-design for a performance piece also named ‘Zakłady na Życie (Plant-Life)’ playing later this year at Festival a/d Werf in Utrecht. Poland is of particular interest, as much of European industry was shifted eastwards as the 1900’s progressed, hence to represent Polish activity is truly to speak of a Pan-European industrialisation. Found objects from abandoned factories across Poland will be exploited as subject matter for a pseudo-museum: a part archeological, part didactic interpretation, based on a workers’ health and safety display, discovered in a power-station in łódz. The show will be a new scene: an eclectically composed installation housing diverse elements, such as documents, commemorative objects, tools and various other production-related matter presented in cabinets. With this physical approach toward history, the exhibition aims to become a lens, both to review and offer new light on a subject, as well as to practice a visual language purely as an act in itself. Coming from a background of installation and sound, Beckett has been engaged in research of a mostly scientific and historic nature, building on a surface layer across various media. Specific areas of the industrial revolution have played muse; such as the evolution of Dalmine (an Italian company producing tubular steel) and the cultural implications of vacuum tubes for the Dutch firm Philips. Along with being a member of The FRÈDERYCK NÙYEGEN Seaside Memorial Band, Beckett has his own registered Scottish tartan, the pattern of which is based on vintage digestive experiments: ‘Beckett-Beaumont’ (#7039). A monograph with Kehrer Verlag of Heidelberg is published early 2009, featuring most works of the past decade. The new piece is coproduced with Festival aan de Werf in Utrecht. Recent exhibitions include All the memory of the world, GAM, Torino; ‘Bagnoli’, T293 Naples; ‘Dalmine (and other industry extract-arrangements)’, Lüttgenmeijer, Berlin; Young Artists’ Biennal, Fundatia Culturala Meta, Bucharest; ‘For the First and the Second Time’, CAC Vilnius; ‘Living Registration’, Bürofriedrich Berlin; ‘Between Thought and Sound’, The Kitchen New York; “Museum of Noise’, Kölnischer Kunstverein, Cologne. 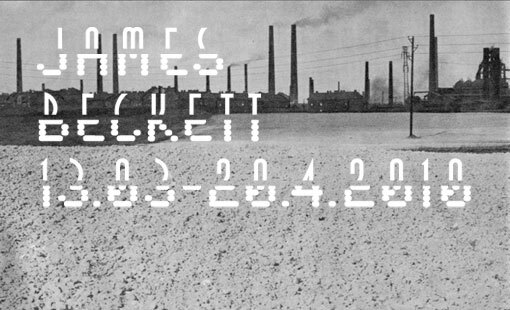 Beckett won the Prix de Rome for Art and Public Space in 2003. The opening will be March 13 from 5 pm till 7 pm and the show is running through April 24th.. The gallery is open Thursday – Saturdays from 1-6 pm and by appointment. For further information and visuals, please contact the gallery; office@wilfriedlentz.com or +31 (0)10 4126459.